Post-war Russian version of German Taifun anti-aircraft barrage rocket. Developed and tested in 1947-1951 but abandoned in favor of the R-110. Status: Cancelled 1952. Payload: 1.05 kg (2.31 lb). Thrust: 7.72 kN (1,735 lbf). Gross mass: 24 kg (53 lb). Height: 2.07 m (6.77 ft). Diameter: 0.10 m (0.32 ft). Span: 0.22 m (0.72 ft). In 1947 SKB 6 of NII-88 was formed with Pavel Ivanovich Kostin as Chief Designer. They were assigned further development of the German Taifun unguided barrage antiaircraft rocket with the objective of producing a missile that could reach targets at 15 km altitude. Components for 700 Taifun missiles had been fabricated by slave labor at Nordhausen, but only 15 were completed by war's end, and of these only five were fired from Peenemuende. 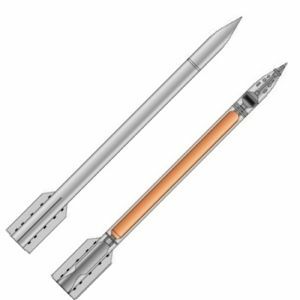 The liquid propellant version of the missile never completed development. It fell upon NII-88 to complete development of this German missile. The resulting R-103 design (liquid propellant version with nitric acid / kerosene engine) was reviewed by a plenary session of NII-88 on 28 April 1947. The project described a 10 km range missile, variants to the basic design using the German Watzal engine, and a launcher based on the German 88 mm gun mount. The project was approved, and firing tests of 200 missiles using German components were conducted at Kapustin Yar beginning in December 1948. A further 202 were fired in the first quarter of 1950 with satisfactory results. June-July 1950 saw tests of both the all-Russian basic R-103 and lengthened R-103A. The latter reached altitudes of 15 km and slant ranges of 18 km. These tests confirmed the need for a larger caliber design to improve the missile's effectiveness, and further work on the R-103 was dropped in favor of the larger R-110. 5 kg (2.31 lb). Maximum range: 15 km (9 mi). Boost Propulsion: Storable liquid rocket, D1-75/M-10, 11.2 kg propellant, Isp=205 s, 2.92 sec burn time, 52 atm Pc. Maximum speed: 4,490 kph (2,780 mph). Family: surface-to-air. Country: Russia. Agency: Kostin bureau. Bibliography: 571.